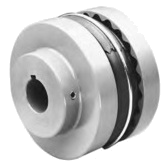 The S-Flex (sleeve) coupling has 5 primary flange types, each with their own benefits. The first four sizes of flanges (size 3J to 6J) are available in this type which differs from the S Type in that the J Type does not have as great a length-thru-bore. This is due to the absence of a projection in the cast material on the J-type flange at the inner face. Thus, where both J and S flanges are available (sizes 5 and 6 couplings), the S flange has a greater maximum bore capacity than the J. 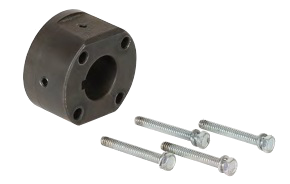 This flange is very economical and provides a coupling which is only slightly more expensive than a comparable jaw coupling. Due to the high torque of the Hytrel sleeves, the J-type flanges can only be used with EPDM or Neoprene sleeves. 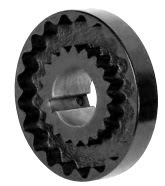 The S Type covers the 11 coupling sizes from 5S through 16S. These flanges all have the projection at the inner face of the casting which provides for greater shaft engagement. The S-type flanges can be used with any of the sleeve materials. The B Type flange is modified to accept the industry-standard QD bushing, and is offered in sizes 6B through 16B. The use of bushings limits the bore capacity of the coupling, but provides a very firm grip on the shaft and can simplify the stock room of many customers (if they use bushings on other power transmission components). Due to the torque limits of the QD bushing, B Type flanges cannot be used with Hytrel sleeves. Similar to the B Type for QD bushings, the T Type is a standard flange modified to accept the style of bushing called Taper-Lock. There are two ways to mount the bushing to the flange, from the serration side (Rear) or from the same side of the flange as the shaft is inserted initially (Front). We call these versions the TR for Taper-Lock/Rear and the TF for Taper-Lock/Front. Be sure to determine if the bushing being used has either UNC threads (which have a 60° thread angle) or B.S.W. (55° thread). As with the B Flanges, the T Type cannot be used with Hytrel sleeves due to the limits of the Taper-Lock bushing ratings. These meet standard API (American Petroleum Institute) spacing requirements for pump disassembly. 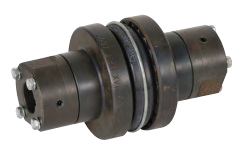 One of the other benefits to the S-Flex spacer couplings is that the various components can be mixed/matched in combinations to achieve dozens of other shaft separations beyond the API standards of 3 1/2", 5", and 7". The SC Type spacer coupling is achieved by using a Spacer Flange (with nomenclature such as 8SC35 or 8SC44) to which is bolted a Spacer Hub (8SCH for example). There are usually three lengths of Spacer Flanges available in each size coupling. The Spacer Hub has the finished bore and keyway for the driver/driven shaft. Each half of the full spacer coupling uses a Spacer Flange/Hub combination. Half-spacer couplings are possible, as well as combining different lengths of Spacer Flanges. S-Flex spacer couplings are available from size 5 through size 14 couplings. Any of the sleeve materials can be used with the SC Type coupling. The Spacer Hub is bolted to the Spacer Flange with four hex head cap screws. By removing these screws, the center section of the coupling can be dropped out. To get technical specifications fo S-Flex couplings, please visit Lovejoy's website product page or download the S-Flex pdf catalog. Detailed installation instructions and videos for these products can also be found here.